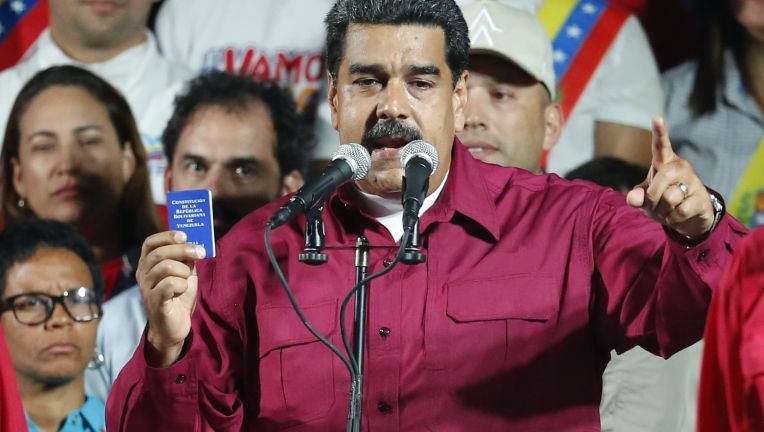 The government of Spain is adding its voice to a chorus of international condemnation of Venezuela’s presidential election. Officials in the European nation issued a statement on Monday promising to join its European counterparts to study “opportune measures” in response. It didn’t say what those measures might entail. The European Union had already imposed sanctions on seven top Venezuelan officials including the head of the pro-government election council in January. The United States and a coalition of 14 nations from throughout the Americas have also denounced the presidential election and promised new steps in response. A senior U.S. official said Sunday the Trump administration might press ahead on threats to impose crippling oil sanctions. A grouping of 14 countries from throughout the Americas is refusing to recognize the result of Venezuela’s disputed presidential election and urged diplomatic and financial action in response. The nations including Argentina, Brazil, Mexico and Colombia vowed Monday to “reduce their level of diplomatic relations” with Venezuela in response. The bloc called on authorities in each of their countries to notify the financial sector about the risks of engaging in business with the Venezuelan government. It also promised to push international and regional entities not issue Venezuela new credit. The statement by the Lima Group adds to mounting international outcry over Sunday’s election. Official results gave President Nicolas Maduro a new six-year term.